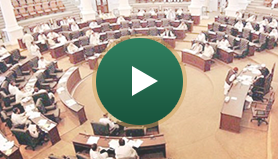 Welcome To The Khyber Pakhtunkhwa Assembly Website! This is your online guide to your representatives, current activities of the Assembly, acts and bills of the assembly as well as details of Committees. To be a prominent public Sector (Unit) Provincial Assembly in Pakistan, known for its local and global perspective, diverse and supportive legislative / communication environment, having sound reputation in research, IT and legislative honours and emphasis on good governance, democratic norms and sound Inter Parliamentary status at local and Commonwealth Parliamentary Association standards.